THE PICKIEST EATER IN THE WORLD: WHO IS MR. COCHINILLO? Tinee's foray into the food business actually began in a different direction. He purchased a brick oven with the intention of whipping up some of the most mouthwatering pizzas that his imagination could concoct. While toying with possible pizza toppings, De Guzman quickly realized that the magnificent brick ovens at his disposal was capable of so much more than firing up pizza pies. Tinee soon discovered the wonderful world of slow roasting meats, with a particular fondness for everyone's favorite star of the Noche Buena feast.. The Roasted Pig. Seeing an opportunity to carve out a niche for himself with the popular Spanish dish, the "Cochinillo", Mr. Cochinillo was born. Mr. Cochinillo uses 25 day old piglets that is bathed in Tinee's special blend of herbs and spices, before being slow roasted in the brick oven for roughly around 6 hours. Perhaps the most tender pork dish that you will ever enter your mouth. Eating Mr. Cochinillo's Cochinillo will take your senses for a ride. The aroma of roasted meat alone is enough to get your tummy rumbling, while the textures will keep your taste buds guessing. The skin will offer you a light crunch as bite down into it, and the meat is so incredibly moist, you will be hard pressed to distinguish it from the fat. If you are a lover of the traditional Lechon, then you will notice that the Cochinillo is not as flavorful as some of your favorites, especially the ones from Cebu. However, it is in the tenderness of the meat where the Cochinillo truly stands out. Umm.. Mr. Cochinillo, Sir? 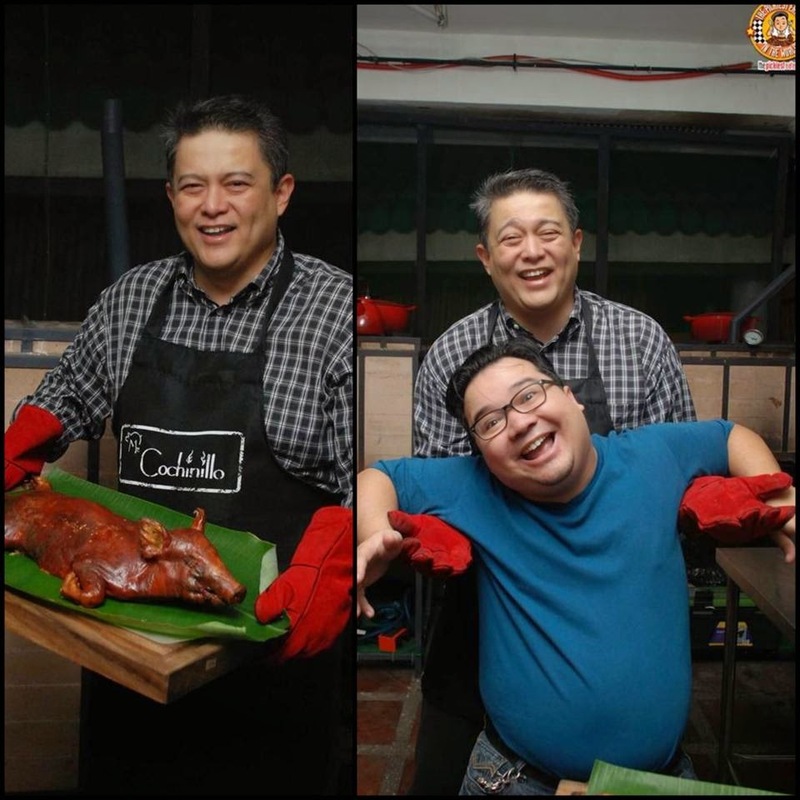 Hindi yata ako kasama sa Menu..
My buddy Spanky Enriquez and I were asked to do the honors of doing the traditional chopping of the Cochinillo, using only a porcelain plate. We started from the neck, and worked our way to the limbs. I can't lie to ya.. That plate went through that pig like a hot knife through butter, letting out a delicate crack as I added the tiniest amount of pressure down on the plate. Soon, I was using the blunt plate to slice through the back of that pig with the skilled precision of a Ninja Master. I was intrigued when I saw a big Paellera filled with what I initially believed to be a Paella. While we were taking a tour of the kitchen, Tinee tells us, how the Cochinillo goes really well with the Seafood Fiduea. I took a long look at the abundance of seafood components used.. Ranging from clams, plump shrimps and Mussels, and wondered how anyone could mistake this for anything else but Paella. A closer look proved that I was wrong.. Yes it was very similar to a seafood paella, but instead of using rice, the ingredients lay atop a bed of stringy noodles. I really loved this, but it threw me into quite the carbohydrate conundrum. Do I go all purist and eat this with the white rice as I have been for practically all my life, or do I try this new & exciting noodles-meets-paella dish? It was truly a remarkable night, where we enjoyed really delicious food and met some wonderful people. The Cochinillo was exception, and you can really appreciate the craftsmanship that went into this wonderful meal. I could definitely see the Cochinillo as a crown jewel to any festive celebration. Tinee's Cochinillo preparation skills may be impressive, but what was most memorable about him was what a down to Earth, and approachable guy he is. It may have been our first time to meet him, but our conversations felt like we were catching up with a relative we hadn't seen in awhile. Speaking of Kindred Spirits, it was the first time Joaquin Valdes joined us in a foodie event! A well known actor in the theater world and a rising Film and TVC director, Joaquin, together with a few partners, has put up the Gentleman's Blog, Berto In Brogues. Berto in Brogues isn't even a month old yet, but in my opinion, it is set to absolutely DOMINATE the "Gentleman's Niche" here in the country. Expect great things from the Berto Boys in the near future! Follow Mr. Cochinillo on Facebook!